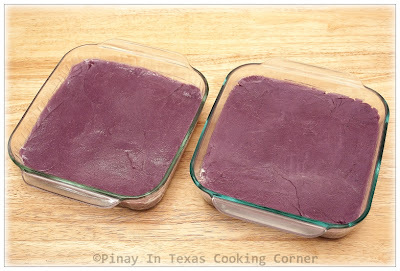 Of all the Filipino desserts that my mother loved to cook, Halayang Ube (Purple Yam Jam in English) is the one I remember her cooking most often when I was little. It's because we used to have ube(purple yam) in our backyard together with kamote (regular yam) and gabi(taro) back then. 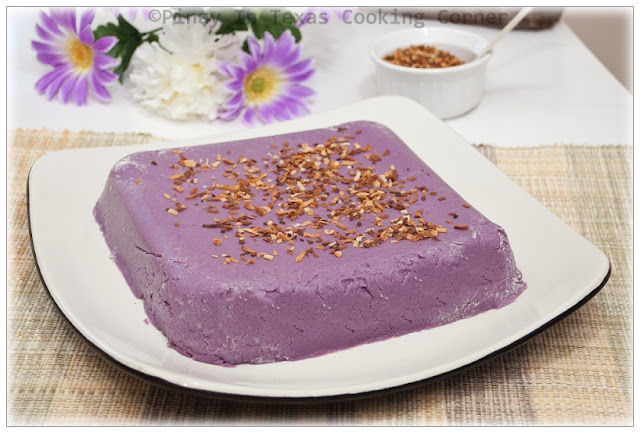 Ube is a tuberous root vegetable that is used as an ingredient in many Filipino desserts and pastries. According to Wikipedia, it belongs to the species Dioscorea Alata that are native to Africa and Asia. It is bright lavender in color and is rich in fiber, potassium and Vitamins B6 & C. It also has anthocyanin, an antioxidant that helps keep your body’s immune system strong and prevent cellular damage. 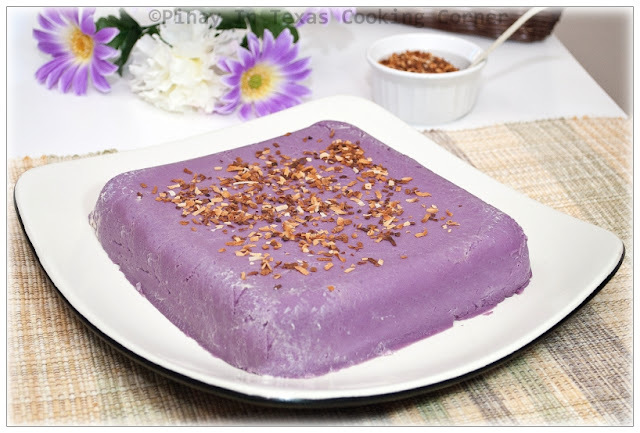 In the Philippines, Halayang Ube is the most popular dessert made from ube. It is prepared by simply mixing mashed boiled ube tubers with evaporated milk, condensed milk and butter. It is then cooked over low heat with constant stirring until it becomes really thick and sticky, and then bottled as jam or molded into different creative shapes (like flower, fish and star) to be served on special occasions like fiestas, Christmas, weddings and birthdays. It is also a favorite topping for the Filipino favorite cooler called Halo-halo. Last week, we got to host The Family Rosary Crusade and I made this Halayang Ube for the final prayer meeting last Saturday. I don't have fancy molds so I just used a square pyrex dish. It may not look very attractive, but it was definitely a hit! I guess the purple color makes it appealing enough...and it's really delicious, you know! 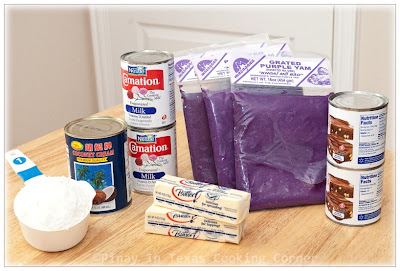 *Fresh ube can't be found here in Texas so I always use frozen grated ube from the Asian store whenever I make halaya. It's good but I must say fresh ube tastes better. 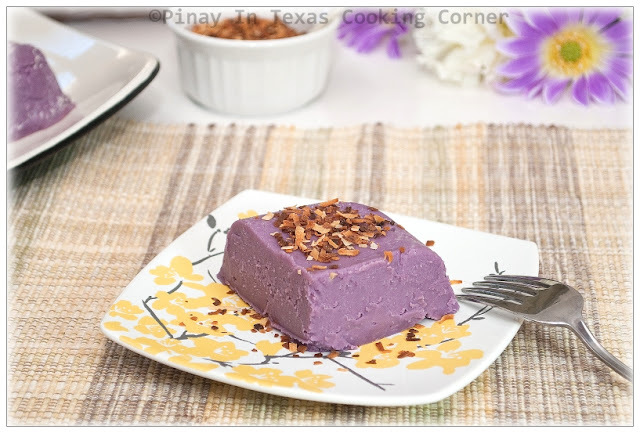 *Latik (fried coconut milk curd) is the most commonly used topping for Haleyang Ube. I included a procedure on how to make it. But it really takes very long to cook, so I suggest that you just use toasted coconut flakes. It's a lot quicker to make. In a non-stick saucepan, pour coconut cream. Bring to a boil over medium high heat. When it boils, turn the heat to low and simmer until all the liquid evaporates and only the curds and oil are left. This will take about an hour. The curds will start forming and you can start stirring to prevent uneven browning. Remove from heat when desired brown color is obtained. Drain from oil. Transfer to a small serving bowl or put in a sealed container for future use. Or if you want to use toasted coconut flakes, here’s how to prepare it. In a skillet over medium low heat, toast desiccated coconut while stirring frequently for 20 minutes or until golden brown Remove from heat and allow to completely cool down. Transfer to a small serving bowl or put in a sealed container for future use. 1. In a large pan over medium heat, melt ¾ cup butter. Add the evaporated and condensed milk and mix thoroughly until well combined with butter. 2. Turn heat to low. Add the grated ube, and cook for 40 minutes while frequently stirring to prevent it from sticking to the bottom of the pan. You will know your halaya is done when it is really sticky. 3. Butter the bottom of the mold/dish that you want to use. Transfer the halaya to the mold/dish. Using a buttered spatula or spoon, flatten the top of the halaya. 4. Allow to completely cool down. 5. Top with latik or toasted coconut flakes before serving. Wow!! Love the purple color Pinay! Such a unique recipe.. I have baked with yam before and it does impart such a wonderful taste to cakes and desserts. However, I sure wish I could get this particular purple yam here fresh-it has such a lovely color! Your dessert is so eye catching and by the ingredient list I know it is a winner-yum! Have a great day. It's actually the purple color that first got me attracted to it when I was a little girl. After tasting it, I realized that's there's more to it than just the beautiful color...it tastes awesome too! Wow it is so vibrantly purple! I have never seen purple yam before but I will be on the look out! With all the coconut I bet this is super tasty and would be a hit in our house! It looks really yummy , Tina ! Love the gorgeous color and with the ingredients that you used I'm sure it tastes divine ! I learn something new every time I visit your blog. I wish I could taste this dish. I'm in the the Washington, D.C. area, and I'm sure that I could find the ingredients. I simply love yam and anything made with yam I will go for it just like this gorgeous looking dessert. I also know that this recipe is quite a fav among my Philippine friends bc I have seen them saying the same as well on their blog. Unlike your side, we get yam by abundance and can be really affordable. Am going to make this, maybe some reduction in the sweet taste. The pics all looks so good Tina. You're so lucky, Nava! I've never seen fresh purple yam here! And do you know how much the frozen one costs??? $3.99 per 16-oz. pack! geesh! What a lovely color! I don't believe I've had this before altho it does sound like some local cake that we get here ... but not in this gorgeous color, that's for sure! Yummy!!! I pinned this on Pinterest! I've never tried making this, Tina. I remember my grandma making this and I can't forget the wonderful aroma in the kitchen while this is being cooked. Thank you for sharing, Tina. Oh yes, Ray! It smells really good while cooking! Thks for sharing the Halayang Ube dish! I always get to learn something new whenever I'm here. Love the colour & I enjoy eating yam too. Would love to try this some day. I love that color! Never tried making this myself but would love to give it a try. The color is just fantastic!!! Wow, what a gorgeous color :)Must be very delicious with nice aroma of toasted coconut flakes! Oh my goodness this looks so good. And so unique and decadent. I am in love with this recipe. The color just pops off the screen. What a beautiful color! Perfect for spring! This this look stunning! What a great color and presentation..wow! You did incredible job!!! where did u buy the grated ube in texas? It's available in most Asian stores. i've had this at Filipino restaurant here and I just got some fresh ube in Chinatown yesterday so will be trying your recipe. Hope you'll like it! Good for you to have found fresh ube! Thanks for trying it out...and thanks also for the link back! Really appreciate it! Hi! Can i ask a question? I'm just wondering. I have this cooked ube halaya in the house made by my mom. After opening and eating a portion, i put it back inside the refrigerator and didn't open it for a couple of weeks i guess. Then when i opened it, i saw molds at the top. It's still more than a half full, can i still eat the remaining after scooping out the molds? Or what else can i do to use that, do i need to cook it again? Because I didn't finish that yet so that i can use it in making halo-halo.. Please do help me with this. Thanks in advance and God bless! PS. I am really hoping that there is still a way to save it, cause we don't have ube crops where i am right now. Thanks. Hi Sarah! You can still save it. Just scoop out the molds, put the remaining halaya in a pan then add 1/4 - 1/2 cup evaporated or fresh milk (depending on the amount of the halaya) and 1-2 Tbsp butter. Cook it with constant stirring over medium low heat until you achieve the desired consistency. Thanks for letting me know...I'll send them your way if my friends ask me. It's 1¼ can of evaporated milk, 12 oz in size.